Besides the fun of doing a booze cruise to France before your wedding, supplying your own alcohol can be a great way to cut costs. Most venues, however, charge you for the privilege of using their glassware, refrigerators, and for opening and serving the booze to your guests. Which is fair enough, but corkage is usually charged per bottle (and can end up costing more than the bottle itself) and the price often varies between wine, sparkling wines/champagne and spirits. There are, however, a few venues who choose not to charge corkage to couples bringing their own wine. Hurray! So we thought we'd put together a list of some of our favourites. P.S. No corkage doesn't necessarily mean a cheaper venue - but if your guests are heavy drinkers and you're likely to get through an impressive number of bottles, this option is definitely for you! P.P.S A lot of non corkage venues often have a late license too (double win!) - you can check out some of these here! The Ashes Barns, set in the foothills of the Peak District National Park, is a beautiful collection of barns available to hire exclusively for you and up to 150 guests. Hire charge starts from £1950 including exclusivity, find out more about this exquisite Staffordshire venue here. Huntsham Court's motto is 'You Stay, Your Way'. Hire this magnificent house, including 19 spectacular rooms, for the whole weekend and have complete control over your special day - your choice of caterers, no corkage, and free use of the house's crockery and glassware for 120 guests. You can explore this gorgeous venue here. Set within 50 acres of gorgeous North Devon countryside, this country estate is the perfect country pile for a big old wedding party. With absolutely no curfew (amazing!) it also has no corkage fee so you can really have the ultimate bash. Take a look at the venue here. Hire The Green in Cornwall as your very own wedding village to celebrate with your friends and family for 3 days. Whether you'd like a traditional wedding, a festival style party of up to 120 guests, or an intimate laid-back affair for less then 50, this flexible venue has it all. Get a quote for exclusive-use hire including accommodation for 32 guests for 2 nights here. North Cadbury Court in Somerset is a stunning 16th Century with 1500 acres available for exclusive hire. With 25 bedrooms, ballrooms, a tennis court, a fishing lake, a gym with swimming pool and even a basement casino, you'll never want to leave. Best stock up on the drinks then! 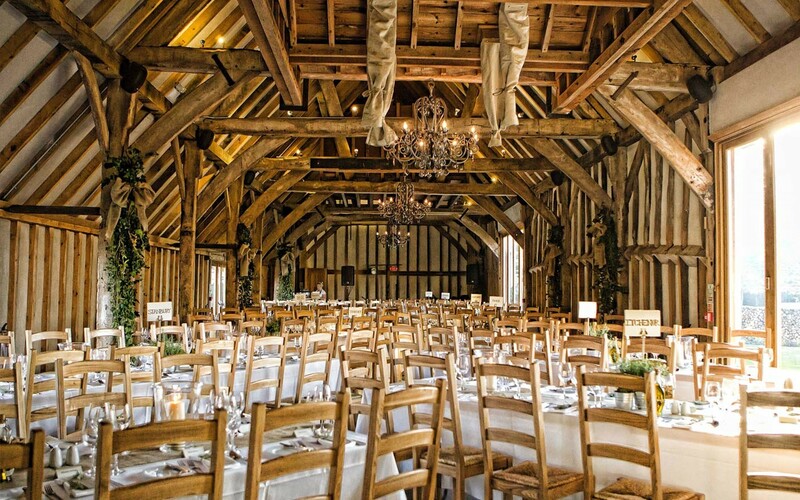 Lillibrook Manor and Barns in Berkshire, just a 40-minute drive from London, offers exceptional flexibilty with a variety of barns and spaces that can be used in different ways on your day. Hold your ceremony in the cloistered gardens before eating and dancing the night away with up to 170 guests in the Great Barn. Enquire about hire and availability here. Hylands Park is one of Essex's most spectacular venues, with meticulously restored period features and the Grand Pavilion at your disposal. You're guaranteed exclusive use so can make the most of all the grounds on offer, and with no corkage you'll be able to keep up to 300 guests fed and very well watered all night long. Set on a working farm in the West Sussex countryside, the beautiful converted barns and landscape gardens offer you the chance to host both your ceremony and your reception on site. Combining the countryside look with stylish contemporary touches, it offers a beautiful canvas for you to put your wedding touch onto! You can explore the venue here. Beautifully designed, Ever After Dartmoor is a beautiful 'wedding village' set within 46 acres of private estate. Offering exclusive use, there is the opportunity to host both your ceremony and reception there along with a gorgeous honeymoon cottage too. Our favourite bit is the glass roofed outdoor terrace with indoor fire and under cover garden that gives a real county-luxe and cosy feel. Explore the wedding venue here. Last but certainly not least Berkeley Castle is a truly showstopping medieval fortress in Gloucestershire, not far from The Cotswolds. Have the castle to yourselves for the day, with a magical ceremony in the gardens where Queen Elizabeth I once strolled, a drinks reception on the gun terrace and a banquet in the magnificent Great Hall. Find out more about packages here. Or if you can't be bothered to buy your own booze, many wedding venues offer fantastic packages including reception drinks, wine with the meal and fizz for the toasts. Search for your wedding venue here. If it's more of a low-key venue you're after, why not take a look at some of our best London pub venues? Bringing the cost down for the venue frees up more money to be spent on food and alcohol, so there are various ways to navigate a budget. Finally, if you're wanting a wedding venue with a late license, take a look at our top 14 here.